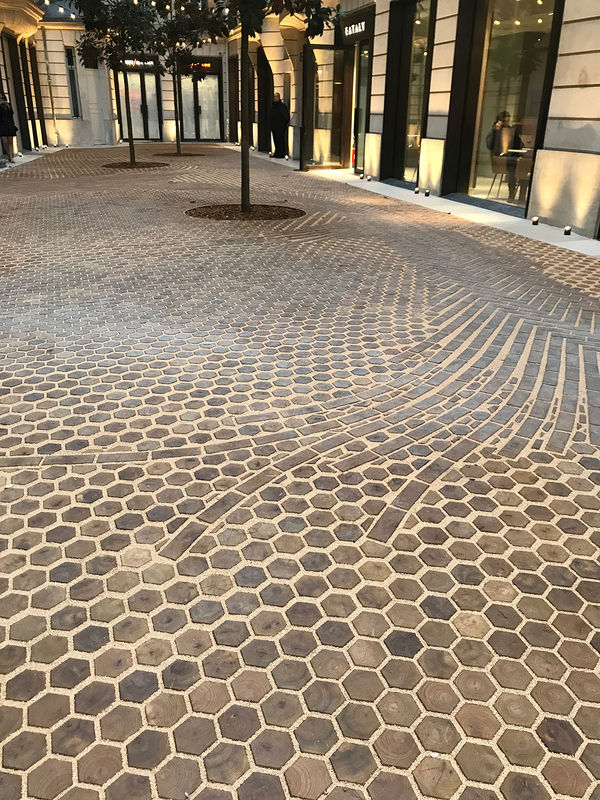 The first courtyard at Les Cours de BHV in Paris is complete. 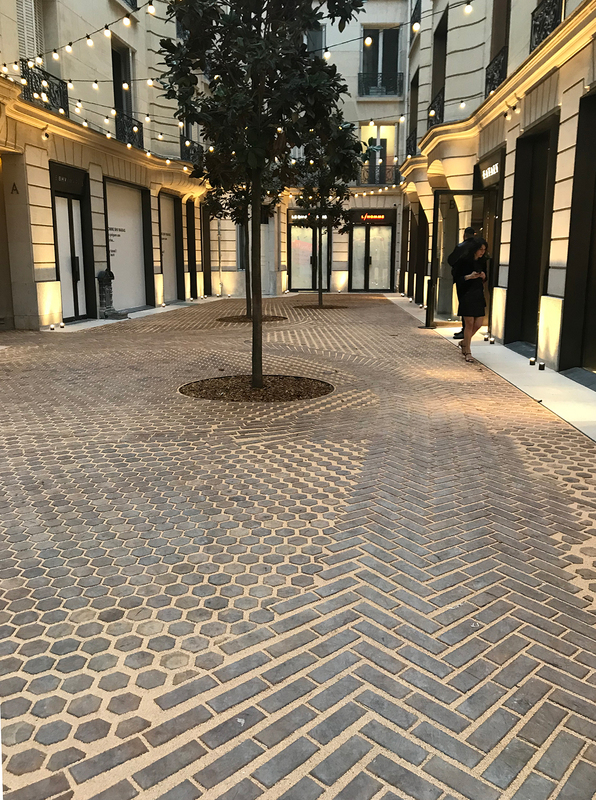 In 2014 we began studying how timber paving could be introduced into our project to bring disused courtyards back into the public life of Paris. 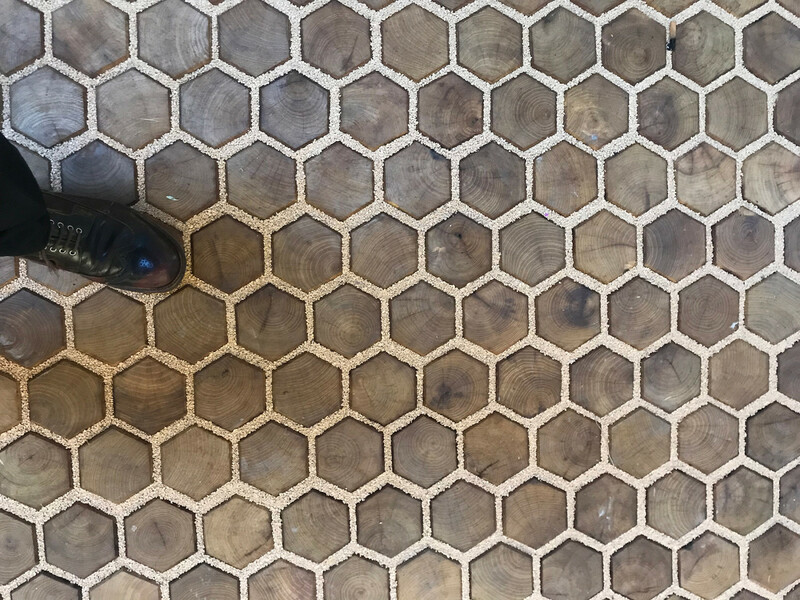 We considered various shapes and sizes of wood blocks and were drawn to the hexagon patterns but as the project was about a public route leading from one court to the next we began to introduce a chevron path of rectangular blocks that playfully lead you on your way. We are delighted that Jamie Fobert Architects is shortlisted alongside five other practices in the Public Building category of the BD Architect of the Year Awards 2019. 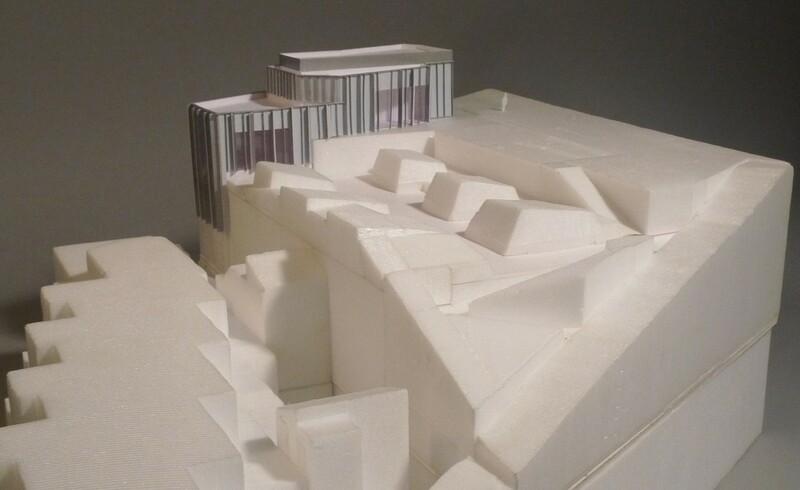 Our submission included three completed public gallery projects – Tate St Ives, Kettle’s Yard and Charleston – and our reconfiguration of the National Portrait Gallery, which is currently in the design process. 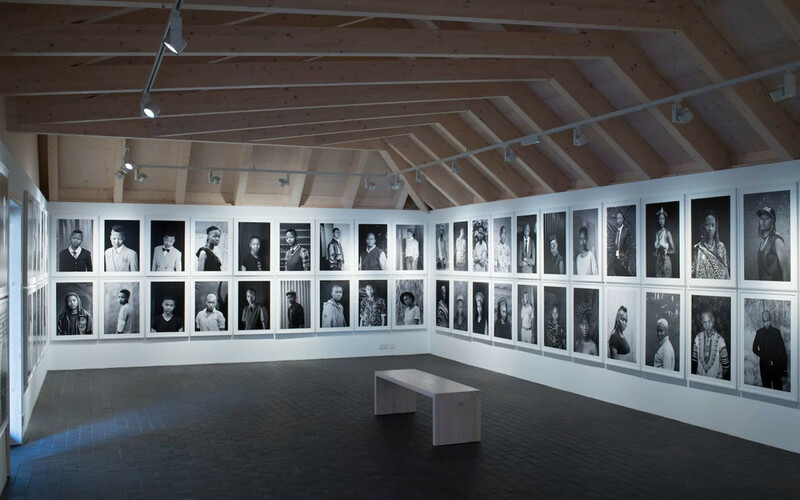 Read more about all the shortlisted practices and their work here. We are so pleased that Tate St Ives was awarded a Civic Trust 2019 Award at the 60th Anniversary Civic Trust Awards Ceremony on Friday evening, at the Imperial War Museum North in Manchester. 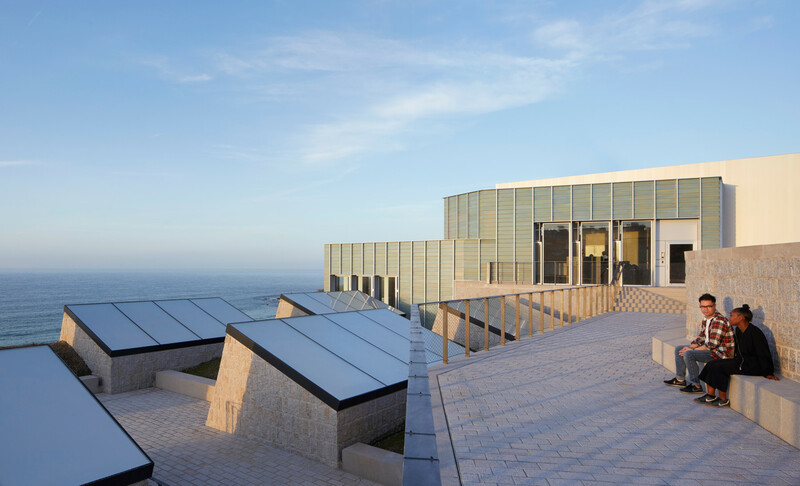 The judges commented that Tate St Ives is “a wonderful space with a strong connection to the community which provides an excellent visitor experience. Stunningly simple, elegant and suited to its context and natural landscape”. 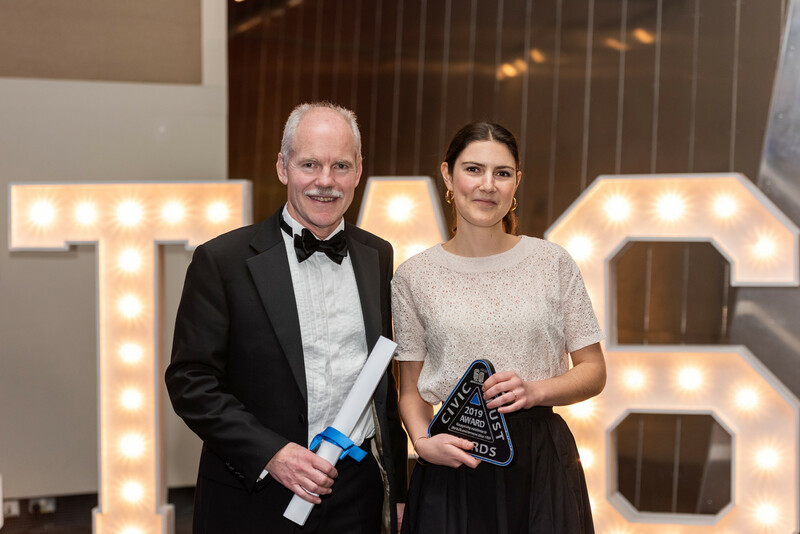 Joana was joined in collecting this award by David Derby from Price & Myers. 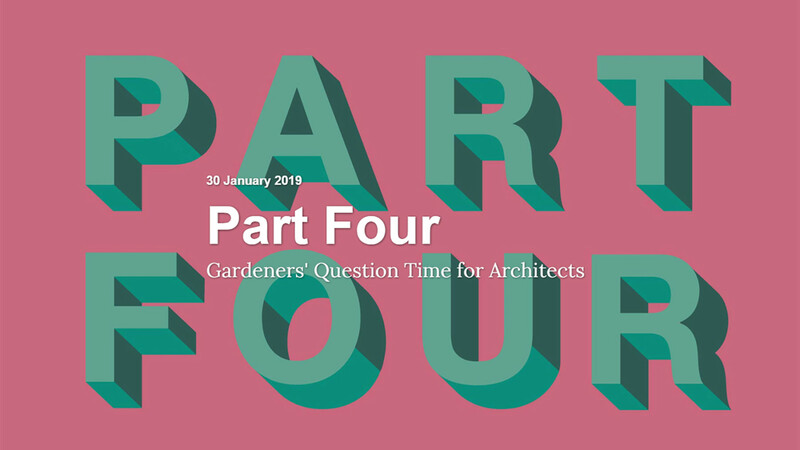 On Wednesday 30th January, Jamie will be on the panel for The Architecture Foundation’s ‘Part Four’ event which gives the opportunity for young architects to pitch questions about professional practice to four panel members.This event offers the chance to ask about all the subjects that are not covered through traditional education, from issues such as fees & finance, practice management, dealing with clients, ensuring sustainable growth & resourcing, self promotion etc. For more info and to register for this free event click here. 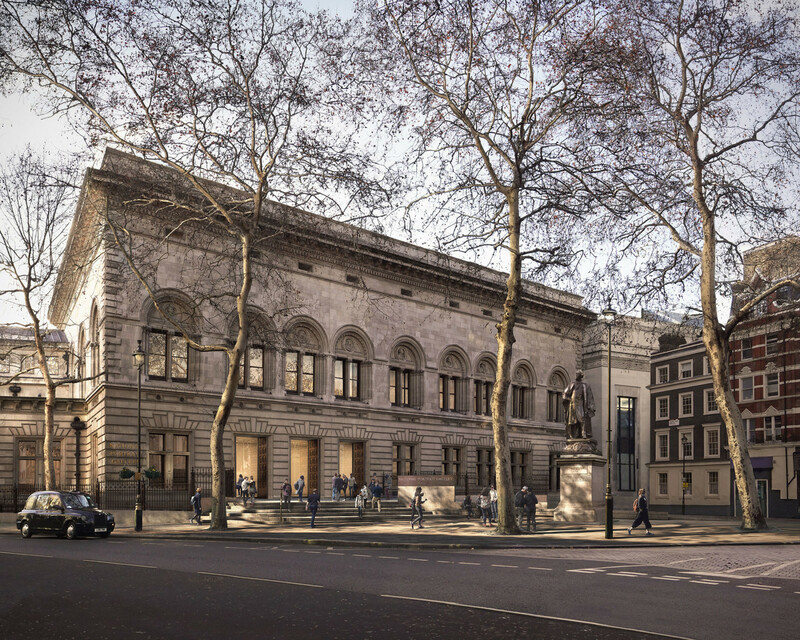 As part of their public fundraising appeal, ‘Making History’, the National Portrait Gallery has today revealed the first images of our proposed designs for ‘Inspiring People’. Working in partnership with historical specialists Purcell and a design team including engineers Max Fordham and Price and Myers, our proposals involve a significant refurbishment of the building, restoring historic features and creating a new and more welcoming visitor entrance and public forecourt on the building’s North Façade, enhancing the Gallery’s visibility and accessibility. 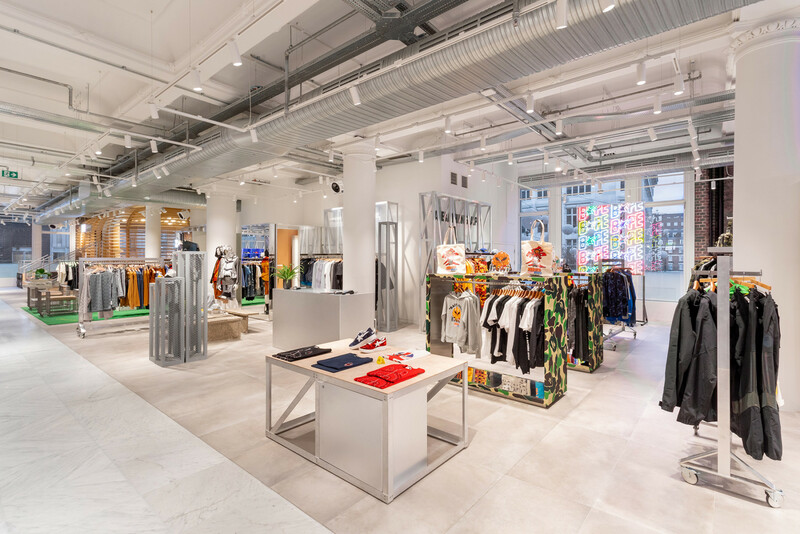 We are excited to share beautiful new photographs by Olivier Hess of our newly opened Men’s Designer Street Room at Selfridges. 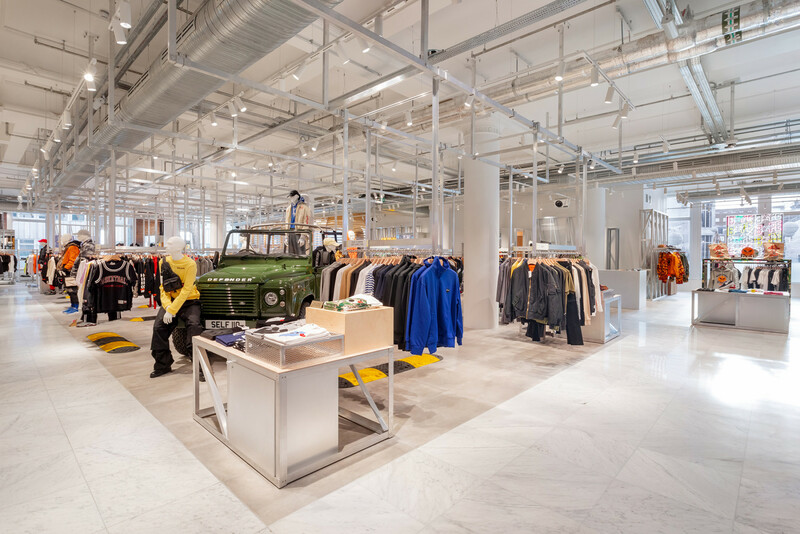 Learn more about our work at Selfridges Menswear. Jamie will be talking at the Annual Dinner hosted jointly by the Cornwall Architectural Trust and RIBA Cornwall, taking place tomorrow, Friday 16th November, at the National Maritime Museum in Falmouth. We have created a set of striking, interactive towers as a pop-up exhibition for I.T to celebrate their 30th anniversary. The 3.4m-tall towers stand sentry-like in rows, inviting attention with full-height digital displays. As passers-by approach, they see only the outermost faces of the towers but as they explore further, weaving between the towers, they discover a hidden destination, where I.T’s merchandise is revealed. We have used light, movement and a sense of mystery and discovery to communicate the excitement and immediacy of I.T as a brand. Open today on the first floor at Selfridges London is our ‘Designer Street Room’. Men’s street fashion is fast changing and dynamic. Its influences and image are constantly in flux. The concept for the new space had to be a flexible framework, tough in both material and form. We have created a light-filled generous room, uncovering the big, beautiful windows and brickwork and restoring the historic columns and ceilings. Making reference to billboards and drive-in movie screens, we have constructed an adaptable set of frameworks in mill-finished aluminium. Each brand was allocated a kit of parts for shelves, rails and tables, comprised of off-the-shelf aluminium bars, T-sections and angles. The frameworks have an industrial feel, yet they are also light and reflective. Their loose-fit construction offers a creative backdrop to whatever the world of street fashion can throw at it. The winner of the RIBA Stirling Prize 2018 will be announced this evening at an event to be broadcast live by the BBC from 20:30 tonight. To celebrate the inclusion of Tate St Ives on the shortlist, here’s the wonderful film made by Jim Stephenson for the Architects’ Journal. Our new womenswear space for I.T, the vibrant, multi-brand fashion house, is now open at their Hysan Avenue store in Hong Kong. 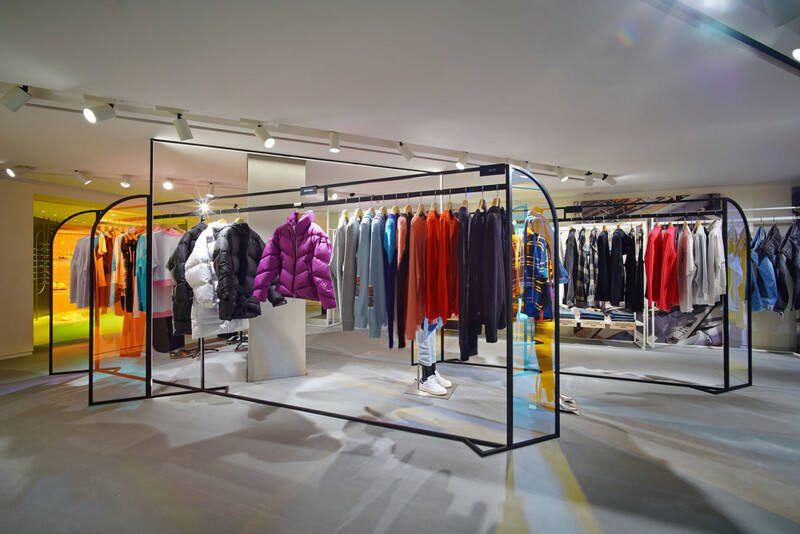 Within the 661m sq of retail space, black powder-coated steel frames hold ready-to-wear collections and large, jewel-like resin wedges and octagons display shoes and bags. In advance of their ‘Art & Architecture’ conference next week, Frieze Academy have published a video interview with Jamie about creating spaces for art. The third edition of the Frieze Art & Architecture Conference looks at recent projects from architects around the world to consider how the form and function of cultural institutions are evolving, and presents long-term works by artists who are reassessing how and where we live. Speakers include Shigeru Ban, Jamie Fobert, Richard Rogers, Christopher Kulendran Thomas, Ellen van Loon, Kulapat Yantrasast and Andrea Zittel. The RIBA Stirling Prize Exhibition 2018 will provide a glimpse of the six schemes shortlisted for this year’s Stirling Prize. The exhibition, which is free, will first be on display at the RIBA’s home at 66 Portland Place, London, before moving to RIBA North in Liverpool. 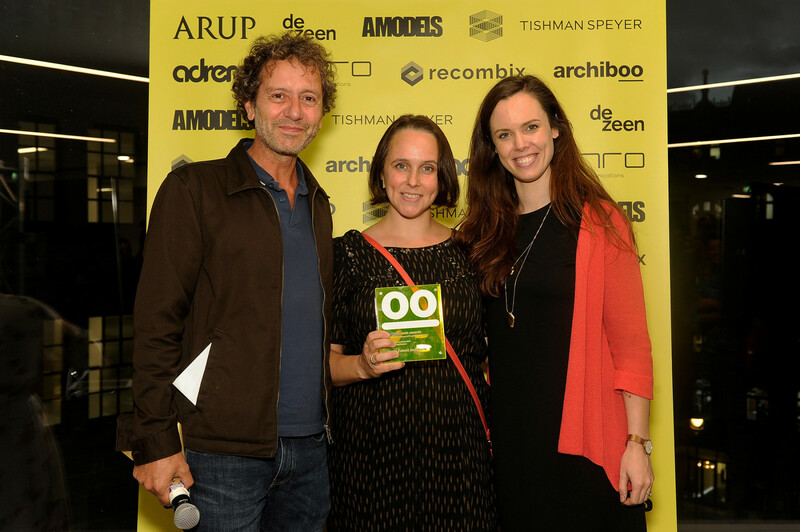 We were delighted to be awarded ‘Best Written Content’ in the Archiboo Web Awards last night. The judges described our website as a ‘no nonsense approach with crisp, honest writing. The descriptions of the work have a nice story-telling quality without too much jargon or too many warm words that lack real meaning. You feel as though you’ve got inside the heads of the practitioners a bit and it has character”. On Saturday 8 September the doors will be opening to the new barns and galleries at Charleston. Complementing the restoration of Charleston’s historic barns by Julian Harrap Architects, we have designed a new building to house a suite of exhibition galleries and a retail space. The gallery interiors are now ready for Charleston to launch their new and exciting exhibition programme. The new galleries echo the proportions of the main living spaces of Charleston farmhouse, and the quarry tile floor reminds us of the agricultural buildings on the site, giving a sense of balance and familiarity between the old and the new. Further fundraising is necessary to complete the building by adding its roof covering, which we hope will be installed early next year. In time, the Cor-Ten roof will rust to echo the distinctive ochre colour of the lichen which covers the farm buildings. 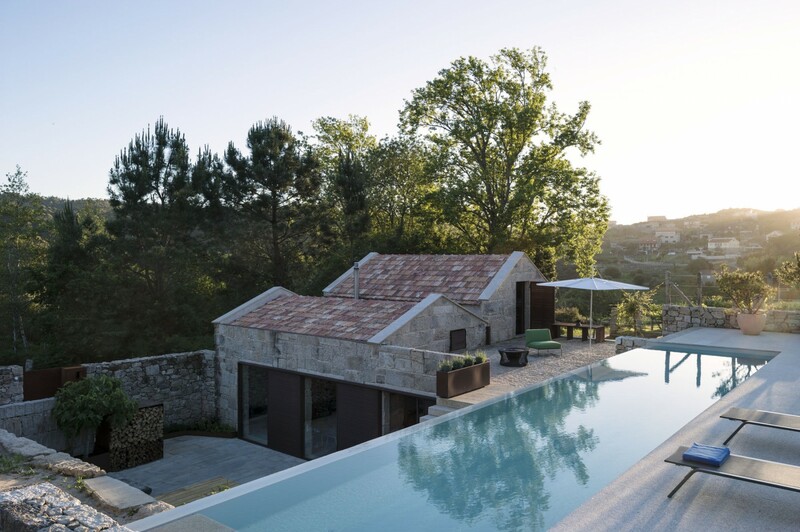 Jamie Fobert Architects is one of ten practices internationally to be considered for the accolade of ‘Architect of the Year’ in the inaugural Dezeen Awards. In addition, we have four projects nominated in the project categories. In the architecture categories, Tate St Ives, the House in the Caribbean and Camino de Playa are in the running; and in the design categories, the jury has longlisted our interiors at the Fondaco dei Tedeschi in Venice. Winners will be announced in November. Taking place on 8 October at the Royal Institution, this year’s Frieze Art and Architecture Conference considers the design of spaces to show, make and live with art. 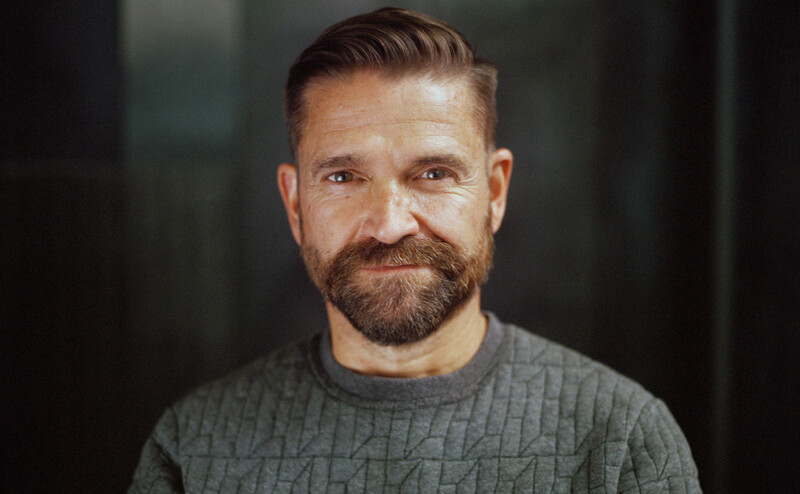 Jamie will be speaking, in conversation with the Director of the National Portrait Gallery, Nicholas Cullinan. Tate St Ives is one of six RIBA National Award-winners to be shortlisted for this year’s RIBA Stirling Prize! 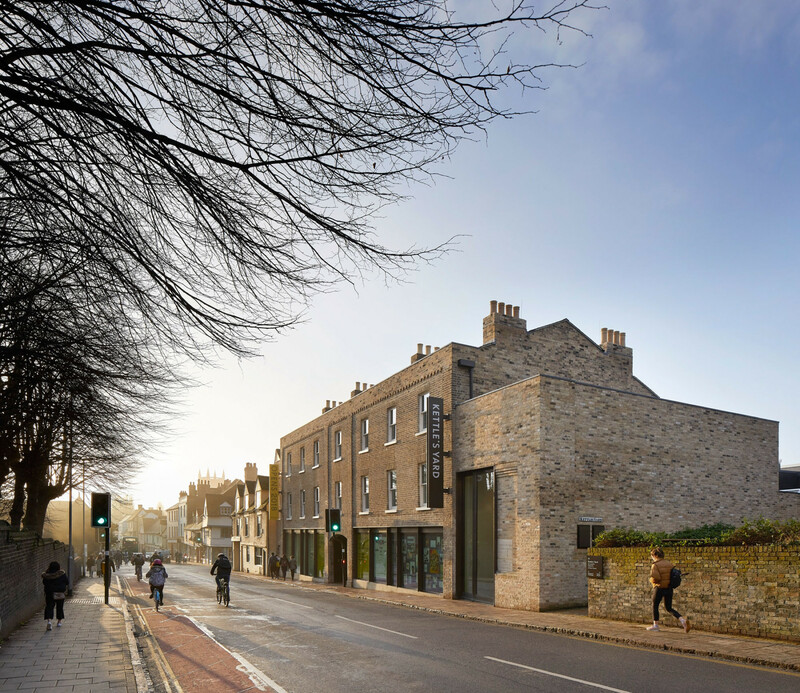 Being shortlisted alongside five outstanding buildings for this prestigious award is a tribute to the whole project team, including our amazing consultants, the Tate St Ives team, and also the people of St Ives. The project has been a lesson in the fruitfulness of really listening to a community. 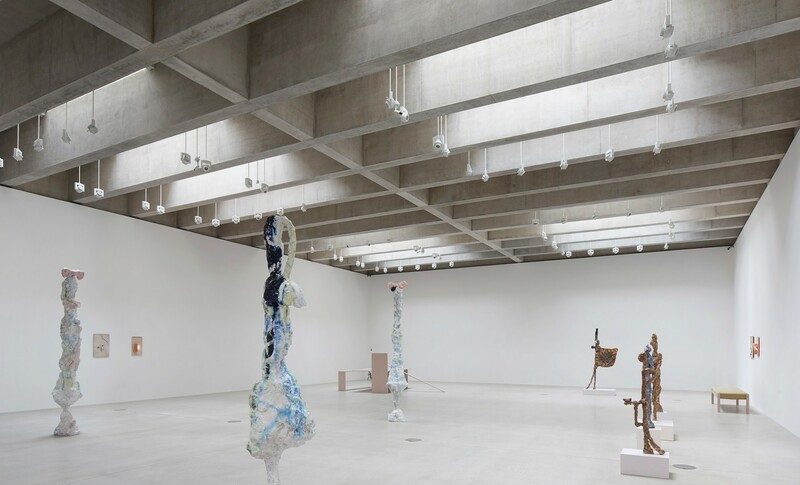 The new building doubles the gallery space at Tate St Ives and provides facilities to support both old and new buildings, but it also gives so much back to the town. The project’s positive reception by the townsfolk and Cornish people has been overwhelming. It is important that recognition for the project’s success is shared with the architects of the 1993 building, Eldred Evans and the late David Shalev, whose work to refurbish their original building, and to create new education spaces, is integral. Last night, at a big celebration hosted by the Art Fund at the V&A, Tate St Ives was announced as the Art Fund Museum of the Year! 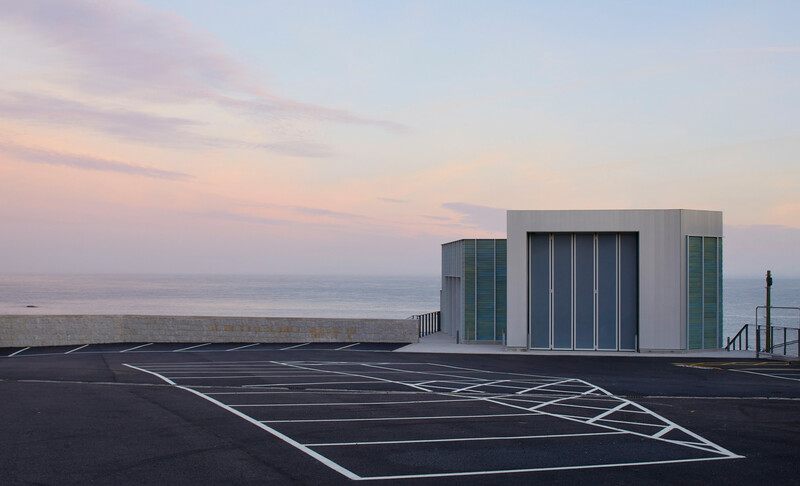 We are so proud to be part of the skilled and dedicated team, including the local community in St Ives, who have worked long and hard to create an innovative and inspiring gallery benefiting the people of Cornwall and far beyond. Published by Kettle’s Yard to coincide with the Antony Gormley SUBJECT exhibition (22 May to 27 August 2018), the front section of this book is dedicated to recent workbook drawings by Gormley and a set of photographs of his present installation at the new Kettle’s Yard. 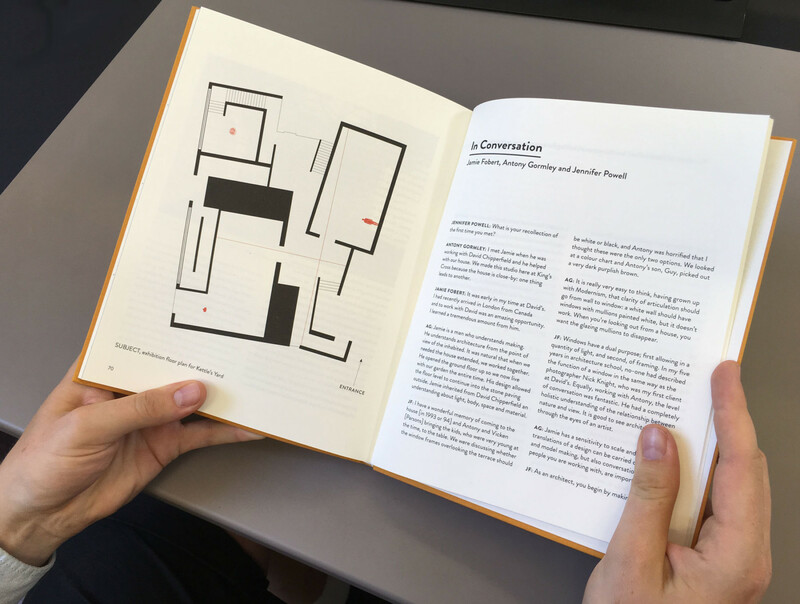 Alongside an essay on the works by Caroline Collier, the book also features a conversation between Gormley and Jamie Fobert. Together with curator Jennifer Powell, they discuss the work and site, sculpture and architecture.